The Retreat offers a unique experience for your wedding, as you will have complete privacy and exclusivity for your entire wedding party. The venue is situated beside a running creek within short distance to the waterfall, and there are ample areas to choose from to get married. 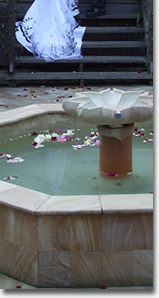 If you prefer the natural environment you may choose to get married on the rock area by the creek, be amongst the natural environment surrounded by the forest, or alternatively you can use the courtyard, with its unique sandstone carved fountain, to exchange your vows. The property is a privately owned boutique retreat, which is located amongst pristine rainforest, situated beside a running creek, only 45 minutes from the CBD or the Airport. We specialize in smaller intimate weddings, and we can accommodate up to 35 guests overnight. The function room easily seats up to 100 guests for the reception for larger weddings. Transport can be arranged for guest not staying overnight. When considering your wedding at Cedar Creek, we can be flexible with our packages as you can do as much or as little as you prefer. Whether you prefer a casual relaxed wedding, or a more formal event, we can work with you to accommodate your needs. If you have a favored caterer, we allow you to use them, as well as do your own alcohol. Alternatively we can do the lot for you, and you can choose from one of our many catering and alcohol packages to suit your budget. Cedar Creek Falls Retreat wants you to enjoy your wedding and make it an event to remember forever. We have a minimum of 2 day accommodation packages which is suitable for family and close friends that have travelled to be together, and to help you prepare the venue for your special day, just the way you want it. We can accommodate up to 35 guests overnight, which includes queen, twin share and loft style accommodation. The venue is ideal for family reunions to celebrate your wedding. You will have exclusive use of the retreat for your Wedding from midday Friday to midday Sunday. Weekdays will also be considered if preferred. This is ideal for the wedding party, family and friends, with a maximum 35 people staying overnight and includes use of the function room on the Saturday for the reception. The cost of the function room is included in the venue hire, and can accommodate up to 100 guests for the reception. Alternatively we can provide all the decorations, flowers and table and chair linen if preferred, at an additional cost. You may choose to be married in the courtyard, in the forest or beside the running creek. There is no additional cost and you. You may decorate the areas however you prefer, with the owners approval. Alternatively Cedar Creek fall Retreat can decorate the areas at an additional fee. Cedar Creek Falls Retreat is flexible with the food and drink options, and can offer full catering or if you prefer you can choose your own caterer. If you were interested in having Cedar Creek Falls Retreat cater, we can send you the menu choices. The menus vary from a casual cocktail and canape` menus, Spit roasts or Gourmet BBQ's to a more formal 3 course A la Carte options. Pricing starts from $39 per person. For your guests that are staying over, we can either cater for your meals, or you can choose to do your own catering for breakfasts and lunches. Most people choose to go out for dinner to one of the local restaurants or pubs on the night before the wedding to celebrate, and prefer to do their own breakfasts. If using an outside caterer a site fee is applicable. We can refer you to a selection of caterers that utilise out property if preferred, or you may choose your own. Cedar Creek Falls Retreat can provide the alcohol packages for your wedding. We will provide all the drinks, alcoholic and non- alcoholic beverages, glasses, bar set up, ice and staff. Again, if you choose to BYO alcohol, there is nominal site fee, and you will have to hire all the glasses, bar set up, cool room, ice and the staff provided by the caterers, agencies or yourself. Please include your name and dates you were interested in, then we can send you more information, and organise a suitable time for you to inspect the property. Don't forget to check out our image gallery!